JC Equipments are leading suppliers and manufacturers of Stainless Steel Heat Exchanger and all types of heat exchanger in india and also welded stainless steel tubes and pipes for a wide range of applications. We are into manufacturing of heat exchangers since 1990. ASME certified (The American Society of Mechanical Engineers) manufacturers in india. We are huge and specialized exporter for stainless steel heat exchanger products and get pleasure from good standing for the reason that of our high quality and competitive price. JC SS heat exchangers are manufactured and developed with TIG welding and mirror or dull buffing finish. Extremely engineered Stainless Steel Shell and Tube Heat Exchangers constructed in support of applications needing sanitary & corrosion challenging performance. Double Tubesheet, Carbon Steel Bolting, Insulated, Tubes, Mounting Feet. It is prepared of imported stainless steel pipe. JC Stainless Steel Heat Exchangers are for the most part of useful in bad water environments caused by pollution or from the chemicals used to counter it. 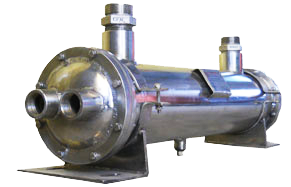 A heat exchanger systems are used to remove heat power from one medium to another without the two media individual varied.